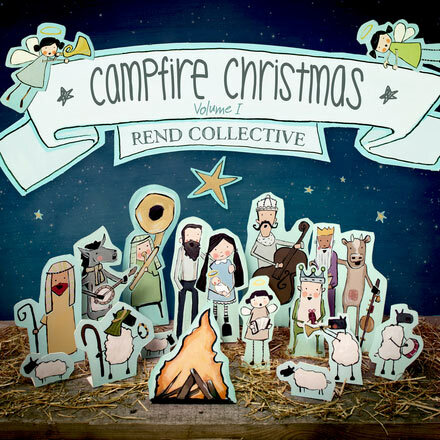 Rend Collective to rejoin Chris Tomlin on "Love Ran Red Tour"
Nashville, Tenn. (September 29, 2015) — Northern Irish worship band Rend Collective will bring Christmas spirit to listeners everywhere October 23 with the release of Campfire Christmas: Volume 1. The celebration band is drawing from their Irish roots and putting their own folkier spin on classics such as "O Holy Night (O Night Divine)" and "We Wish You A Merry Christmas." Fans can get an idea of what to expect from the album from "Joy To The World (You Are My Joy)," set to hit radio this Christmas season. Click below to check out the official music video for Rend Collective's upbeat version of the song. Rend Collective's fifth studio album, As Family We Go, released last month, hitting No. 19 on the U.K. Albums Chart and No. 9 on U.K.’s Digital Albums Chart, making it the highest debut for a Christian album in the U.K. in almost 20 years and the highest ever Christian album debut on the U.K. Digital Albums Chart. As Family We Go also hit the No. 1 spot on the iTunes Christian albums chart in the U.S., U.K., Canada, Australia and New Zealand and landed in the top ten albums overall in seven countries including the U.S., U.K. and Canada. This October, Rend Collective will once again hit the road with Chris Tomlin for the second leg of his "Love Ran Red Tour." For additional tour information, click here.